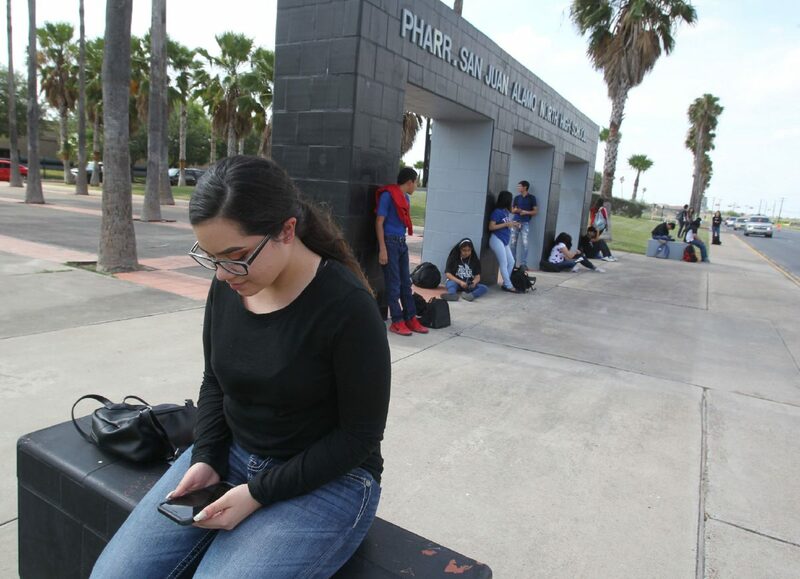 PHARR — With sudden news of a possible district-wide overhaul and a few weeks to make a decision, Pharr-San Juan-Alamo school district teachers are trying to figure out whether they move forward with a plan that could give them more freedom or wait for answers. Last week, teachers were introduced to a plan to adopt a charter school status as early as the 2018-19 school year in order to tap into more state funding and give educators resources to innovate. Superintendent Daniel King conducted an initial presentation for teachers on Thursday in which he laid out his plan to use Senate Bill 1882 in a different way. The bill was passed by state legislators in 2017, allowing public school districts to contract with open-enrollment charter schools or other education institutions in order to turn around underperforming campuses. Ariana Megan,18, a senior at PSJA North waits for her after school ride at PSJA North High Monday, May 14,2018. Megan had mixed thoughts on the charter initiative. The district would in turn give up control of the campus to the charter and its funding level would then be matching charter schools, if their regular funding falls below that line. King’s idea, however, is to create those partnerships with non-profit education organizations, called Innovative Management Organizations or IMOs, to adopt the bill and be able to tap into that funding and give teachers more decision-making power throughout the entire district. King dubbed the plan EmpoweredED, as it aims to help teachers take advantage of their campus’ strengths and come up with ideas to address their weaknesses rather than having to adopt district-wide initiatives that might not always fit their needs. The plan restructures the school district’s leadership as it would contract with five to seven IMOs that would answer to the board of trustees and be in charge of helping campuses reach their goals. The increase in funding would result in better teacher compensation and the ability to implement innovative ideas, King said. But the plan must first be approved by teachers, then the board of trustees, and finally the Texas Education Agency before anything can be implemented. 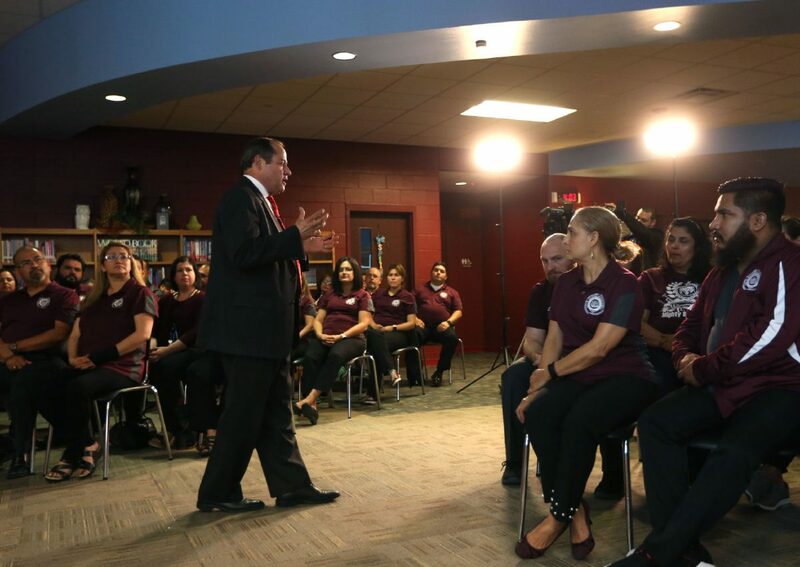 During Thursday’s live presentation at Yzaguirre Middle School, from where it was broadcasted live to all campuses, most teachers seem to respond well to the idea of having more control over implementation of programs and curriculum in their campus. Members of the AFT steering committee echoed the enthusiasm behind a plan aimed at positive changes. They haven’t decided which way they are leaning toward as far as a vote, they said, but they would like to have enough time to be involved in the different processes, including vetting of the partnering organizations, development of contracts and committee selections. Members of the stirring committee echoed the enthusiasm behind seeing a plan aimed at positive changes, and said that while they haven’t decided which way they are leaning as far as a vote, their main concern is timing. They would like enough time to be involved in the process, including vetting of the partnering organizations, development of contracts and committee selections. “This area is underfunded,” said Cerda, who has been with the district for 11 years. “Our students deserve a lot better, so more funds for them, more opportunities — who doesn’t want that? King plans to tour schools for the next few weeks to answer teachers’ questions, and each teacher from each campus will get to vote on whether or not they want to see this implemented. The original idea is for this to be a campus-wide move, he explained, but he cannot force teachers to implement something they don’t want. And because additional funding depends on this partnership, it can only go to participating campuses. As estimated by the district, the partnerships could yield about $900 more per student per year, or $28 million per year if all 43 campuses participate. The plan has gotten positive feedback from the Texas Commissioner of Education so far, King said, but a full-detailed proposal would need to receive approval. If approved, the first year would be more about putting the pieces together than implementation, he said, since this is a unique plan that is full of firsts for everybody involved. Zoltan Csaplar, AFT national representative, said they haven’t taken a formal position for or against the proposal, but said that waiting until 2019-20 could give them a better chance to fully understand what the deal would mean for teachers and their schools.